The Swedish ro-ro freighter TRANSFIGHTER arrived from Finland on Tuesday morning to load paper products for shipping to Jacksonville and Savannah. She was delivered from her Polish builders, Stocznia Gdynia, in 2001 and later she was lengthened in Germany by Blohm and Voss, this work being done in 2006. She is now 178.6 metres overall, and has a deadweight of 18,855 tonnes. 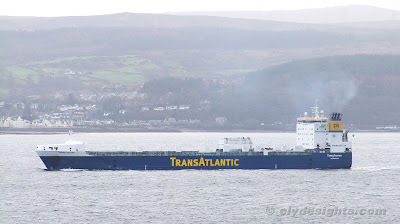 TRANSFIGHTER is a sister of TRANSPINE and TRANSWOOD, two ships that have called at Greenock over the past couple of years.